Amos Elon sets out in his spare and sparkling new book to show that the unparalleled religious importance of Jerusalem also imbues the city with a unique political and social life. This is what accounts for "four thousand years of history, innumerable wars,...twenty ruinous sieges, two intervals of total desolation, eighteen reconstructions, and at least eleven transitions from one religion to another." If there is any single theme in this account of the "world's largest little town," it is the intense, difficult relationship between divine and mundane, and the jostling between some of mankind's highest and most barbaric actions. Elon is particularly good at showing how, from the start, Jerusalem's special religious features made it an anomaly, a city located neither on sea nor river, not on a trade road, not on a natural fortress, and not near good pasturage or mineral resources.The one thing it has is an abundance of is holy sites. Religious features define those qualities, great and trivial, that make the city unique. Invested with the holiest monuments of Judaism and Christianity, and important ones of Islam, Jerusalem has possibly the highest per capita presence of religious functionaries; and by similar token, Elon speculates, it also has the highest number of "eccentrics, crackpots, and monomaniacs." History and politics fill the place with oddities; to name just one, it turns out that the maître d' at a restaurant run by the Catholic church is by statute a monsignor entitled to travel on a diplomatic passport. 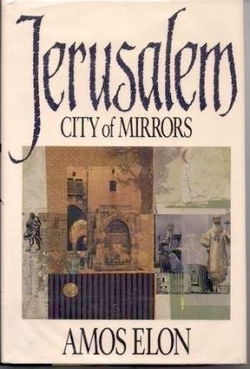 While Jerusalem: City of Mirrors at times reads like a valentine, especially when Elon describes its physical qualities, he severely decries the spirit of the place, wishing to free it of the religious grip. "Jerusalem is a city loved too well yet never quite wisely," he observes. "Where there is so much destructive memory, a little forgetfulness may be in order." As a resident of Jerusalem, the author is only too aware of the deadlock that dominates its political life, with Jew and Arab equally set on controlling the city. The bitterness and inflexibility of this impasse renders Elon hopeless; he has no plan to offer, no policy to hawk. The book has two main problems. The less serious has to do with ignorance of Islam; Elon gamely tries to give this religion its due in the history of Jerusalem, but the gaps in his knowledge are apparent. His assertion, "In Islam, the prophet is sovereign " completely misses the point about Islam (the prophet is a man, God's laws are sovereign); his reference to Sufis, Bedouins, and Gypsies as "Moslem sects " suggests a need to consult an elementary primer on Islam. Second, Elon cannot resist gratuitous attacks on his Israeli countrymen, especially those piously inclined. In passages which recall Christian anti-Semitism, he describes ultra-orthodox Jews as "reading themselves blind in dark, dank rooms" and pounding the words of their texts so finely, "they have long ago fallen to dust." In one particularly odious reference, Elon compares the speech by a member of the Israeli parliament to "the rabble-rouser in Chaplin's Great Dictator "-a slightly indirect way of comparing the man to Hitler. Nor can Elon resist taking nasty shots at his government. His statement that Israel "has often felt secure only at the price of making her neighbors feel insecure " is hard to reconcile with the actions of a government permanently threatened by its neighbors. These deficiencies aside, Elon has written an informative urban biography whose abiding home is probably the travel bookshelf. Its main audience will be the many visitors to Jerusalem. In short, this is precisely the sort of account you hope to find in the book shop after having checked into your Jerusalem hotel.